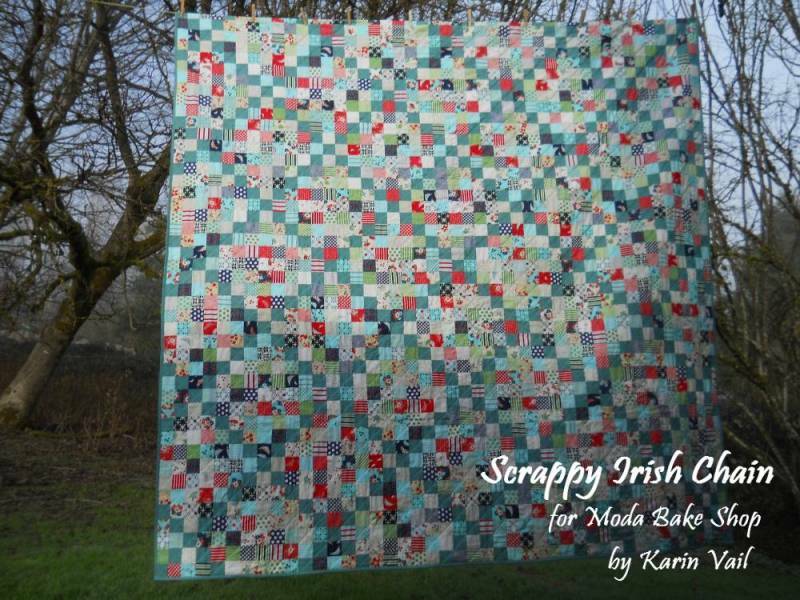 This quilt was inspired by the Irish Chain pattern, but I chose to not leave any large solid areas – this one is totally scrappy! 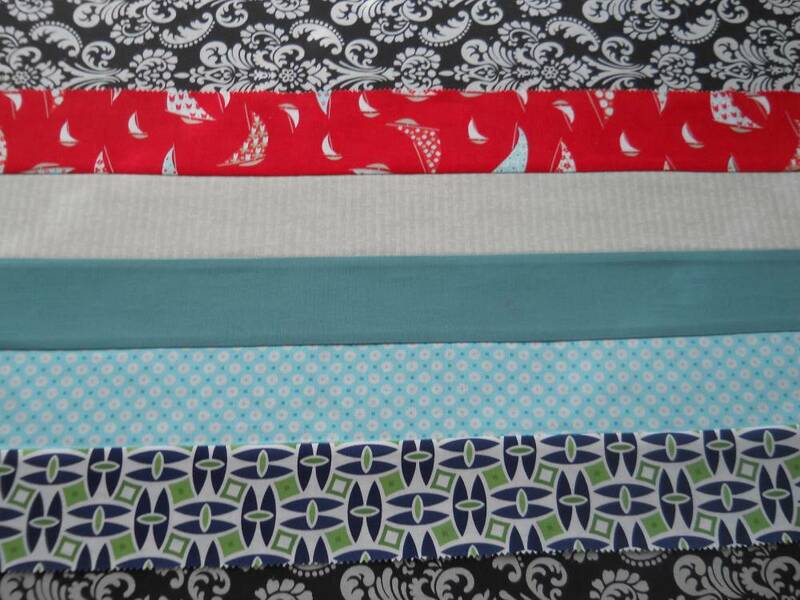 -OR 6 1/2 yards for backing if you prefer to use all one print. 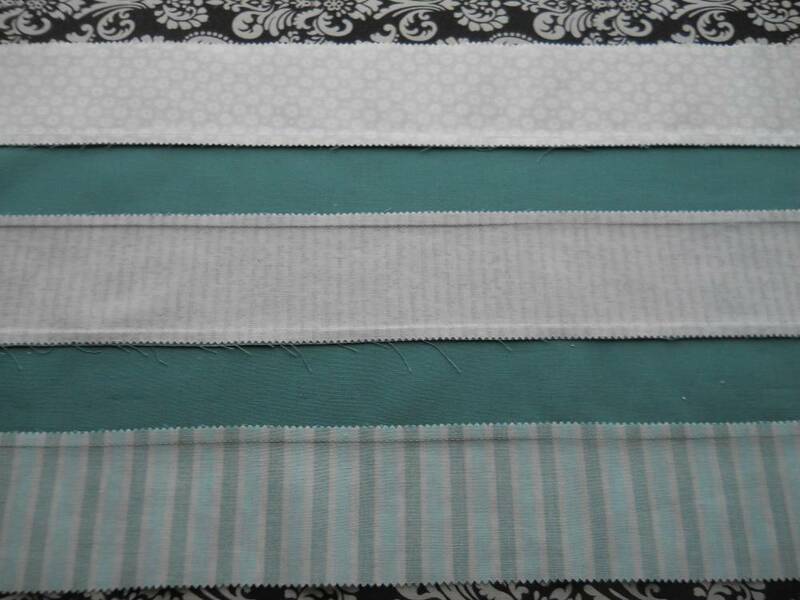 Start by cutting 2 1/4 yards of the Moda Bella solid into 2.5”xWOF strips. 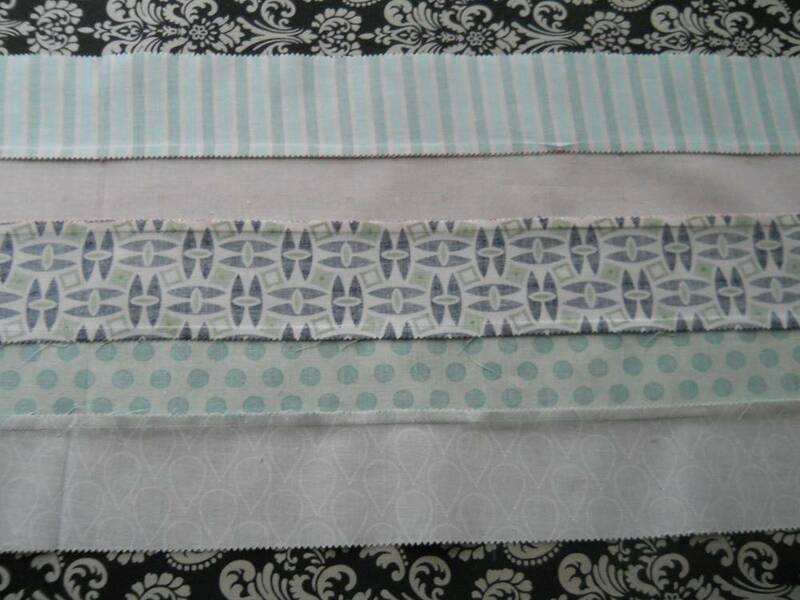 This will give you enough for the ‘chain’ in the quilt as well as the binding. 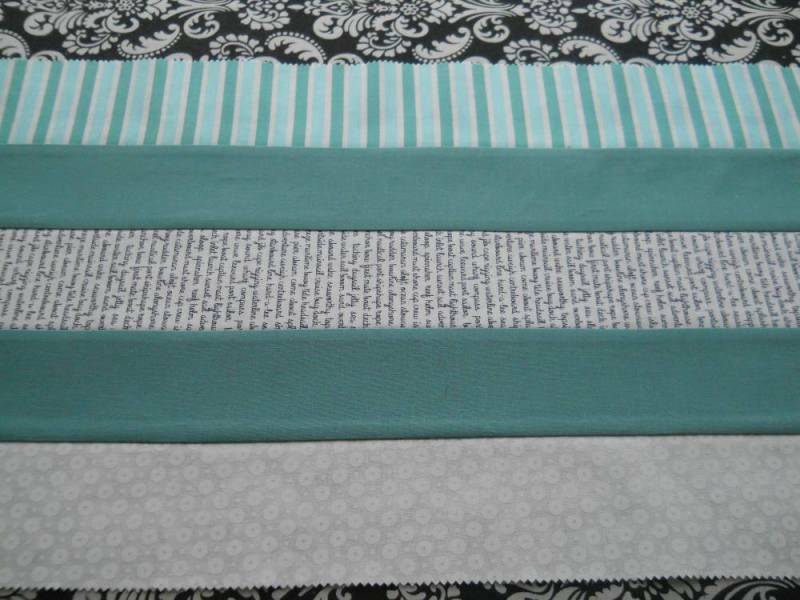 You should get 32 strips (23 for the blocks and 9 for the binding). 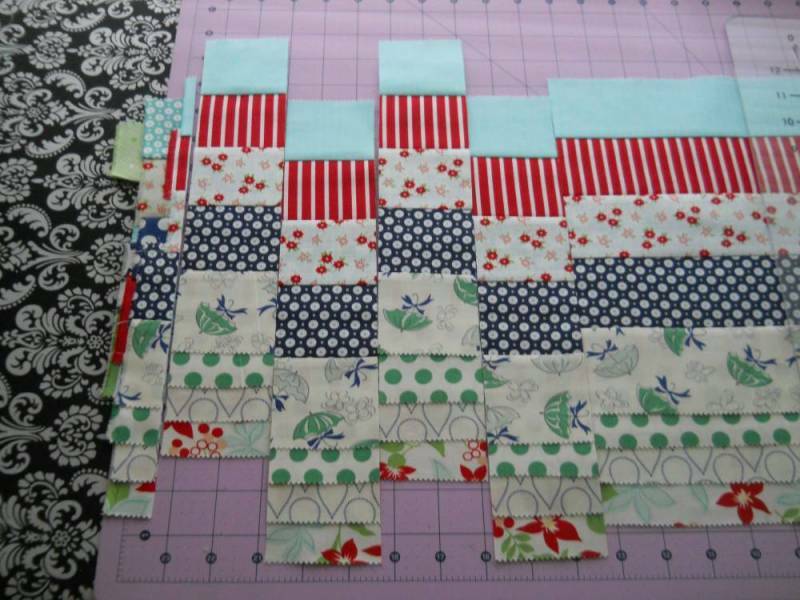 This quilt will consist of 2 different alternating blocks. We will refer to the blocks with the solid in them the ”A” blocks, and the blocks with no solid the ”B” block. 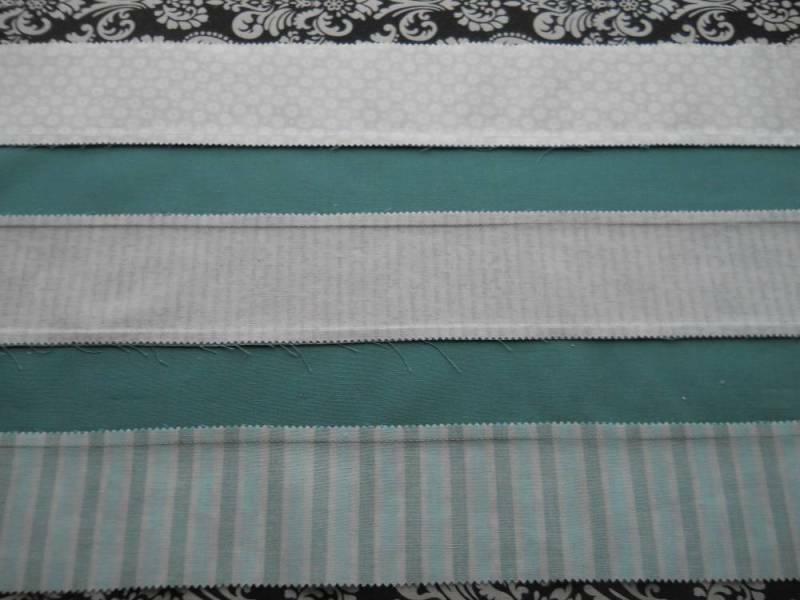 We will be working with strip sets of 5 strips. 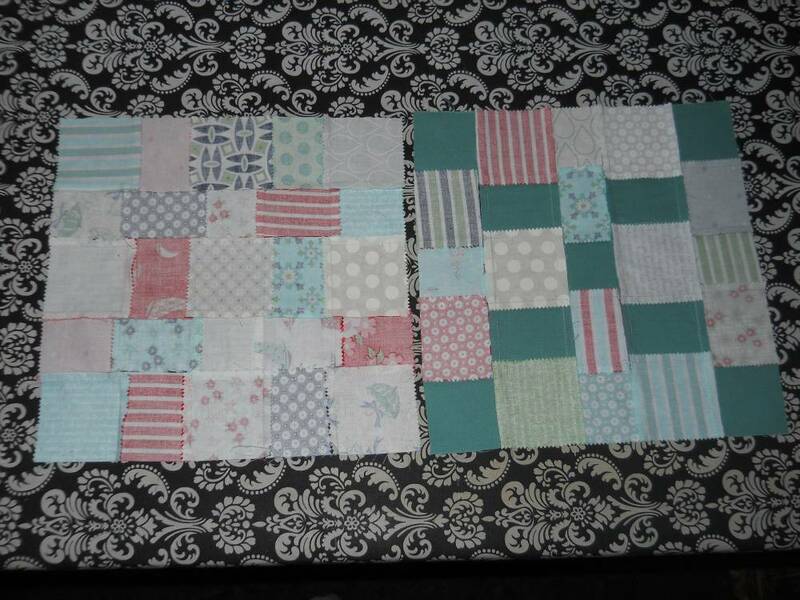 You will need 42 print strips and 23 solid strips for the ”A” blocks, for a total of 65 strips (13 strip sets of 5). 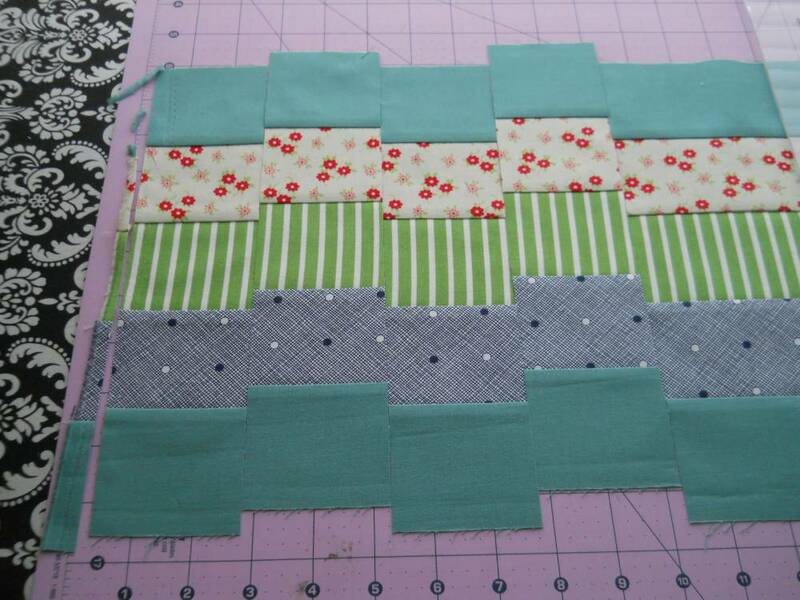 You will need 60 strips for the ”B” blocks (12 strip sets of 5). 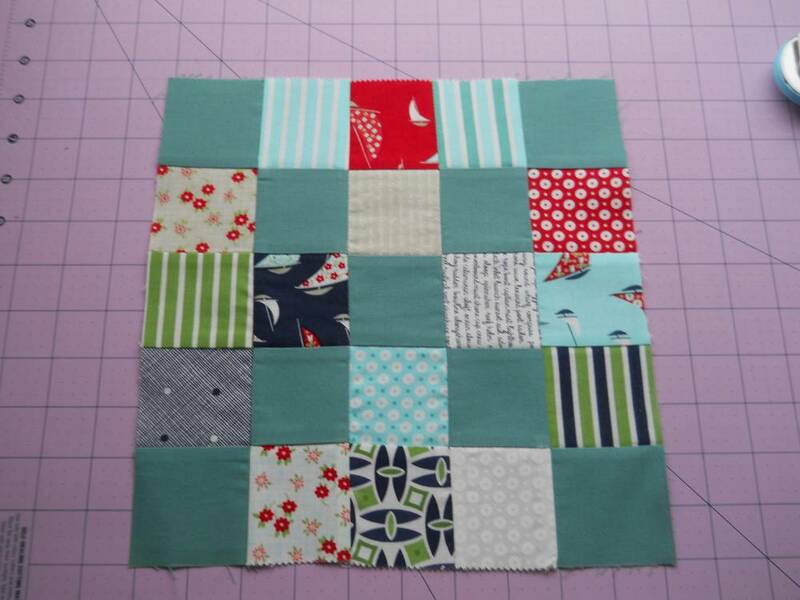 I will give directions for pressing the seams so that your ”A” and ”B” blocks will go together so that the seams will nest no matter what direction the block is placed. Now, you can stack up your strip sets and subcut them into 2.5” wide strips. 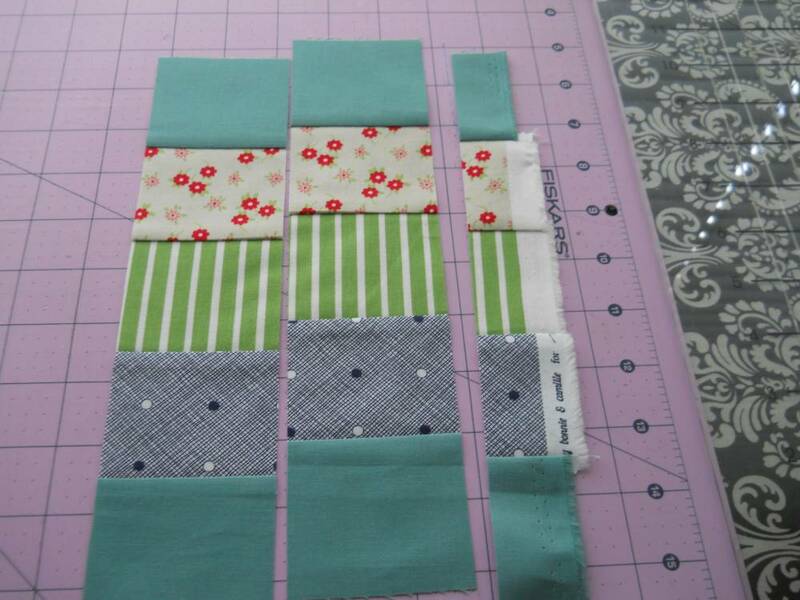 Start by straightening up one end, then cut across your strip set every 2.5”. 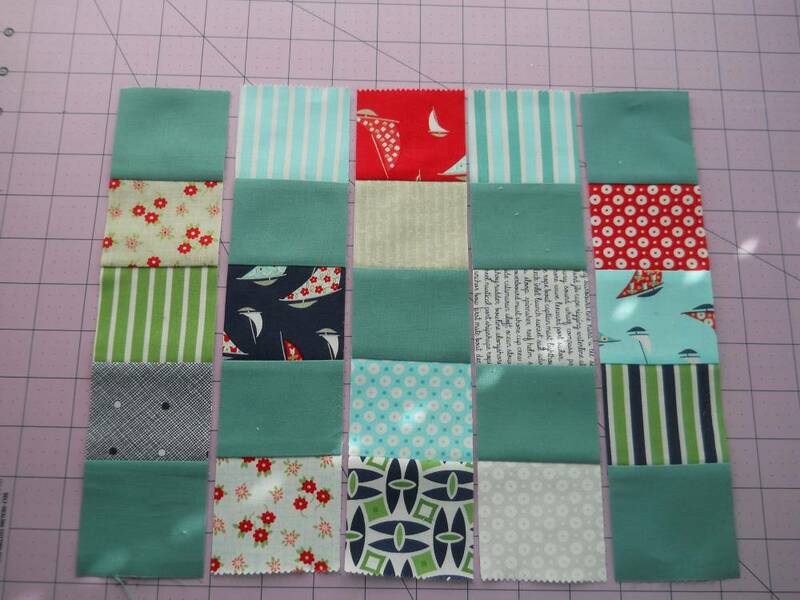 You will make 41 of these blocks. There will be a few pieces left over. The ”B” blocks are assembled in the same way, but the seams will be pressed just the opposite so that they nest with the ”A” blocks. Join your blocks into rows of 9 blocks. 5 rows will begin and end with an ‘A’ block, and 4 rows will begin and end with a ‘B’ block. 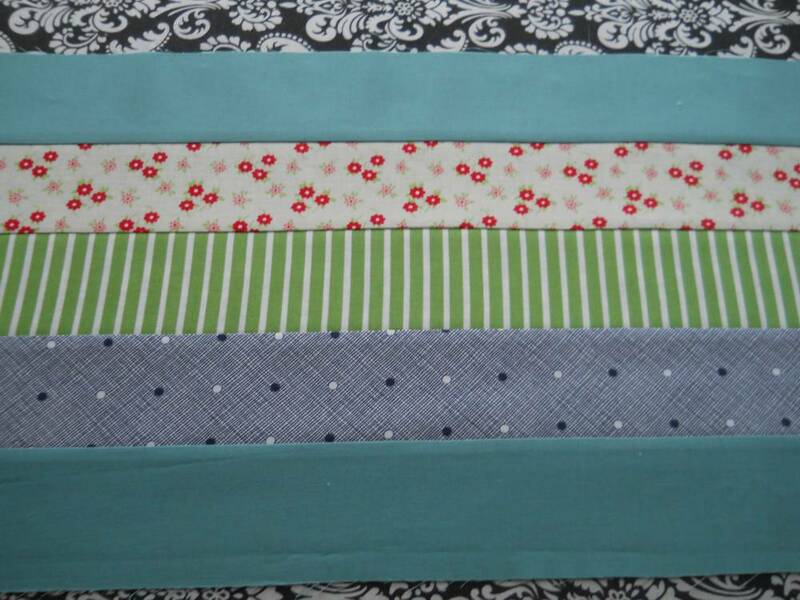 Press your seams toward the ‘A’ block (shown above), and then sew your rows together (again, all the seams will nest!). 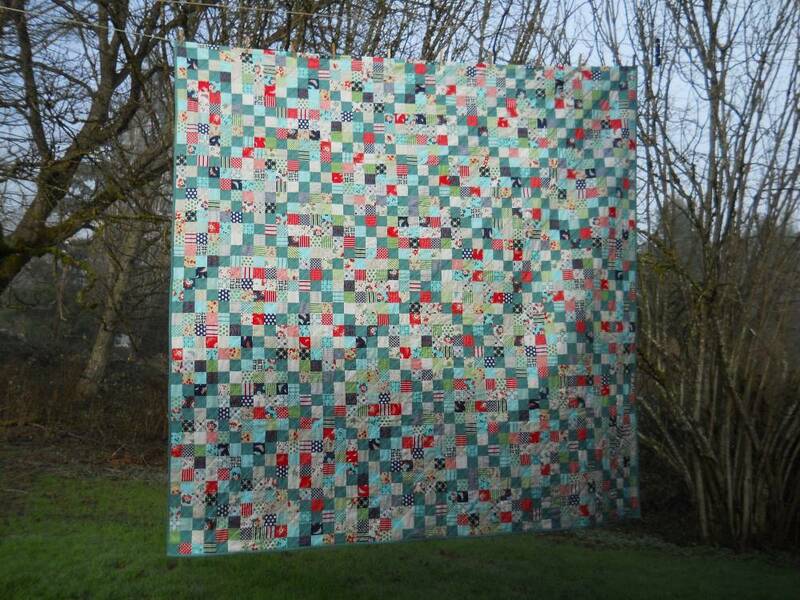 You will now have your complete 90.5” square quilt top! 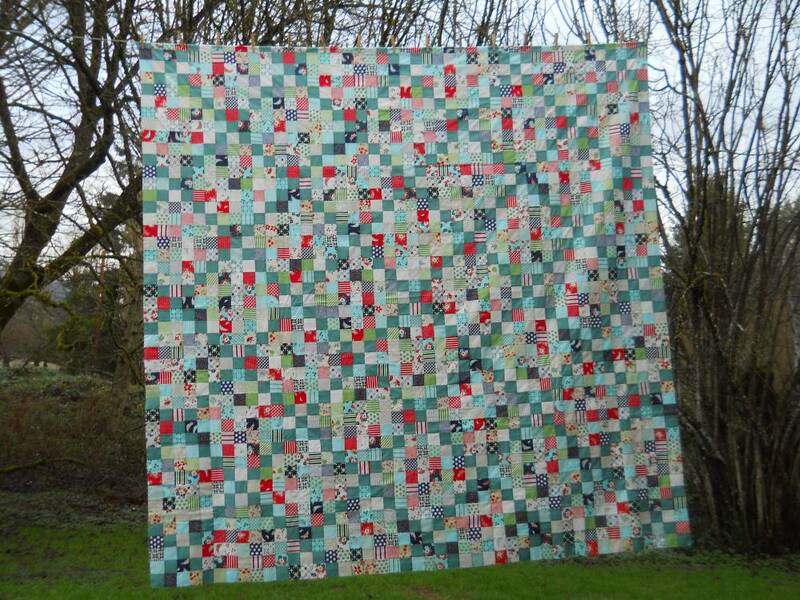 One beautiful scrappy 90.5” square quilt! 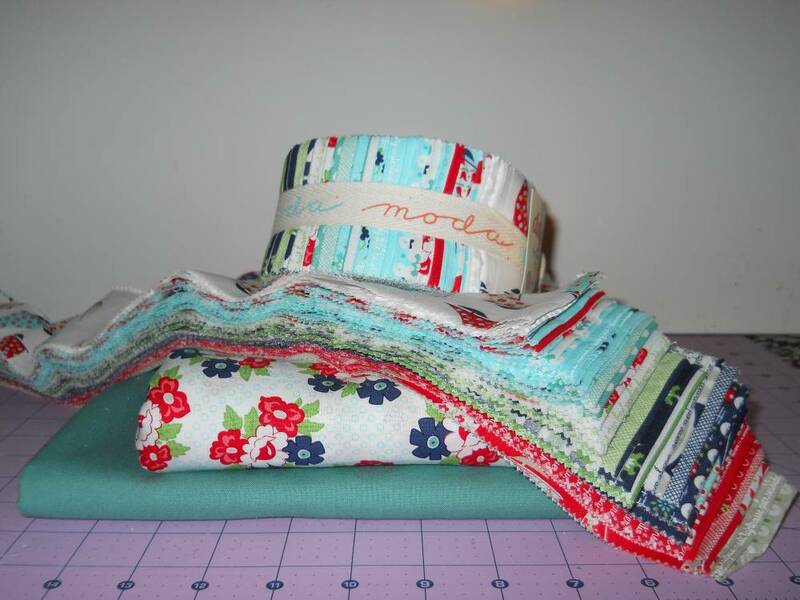 This entry was posted in Jelly Roll, Moderate, Quilt and tagged April Showers, Bella Solids, Bonnie and Camille, Cascade Quilts, Daysail. Karin I LOVE this quilt! 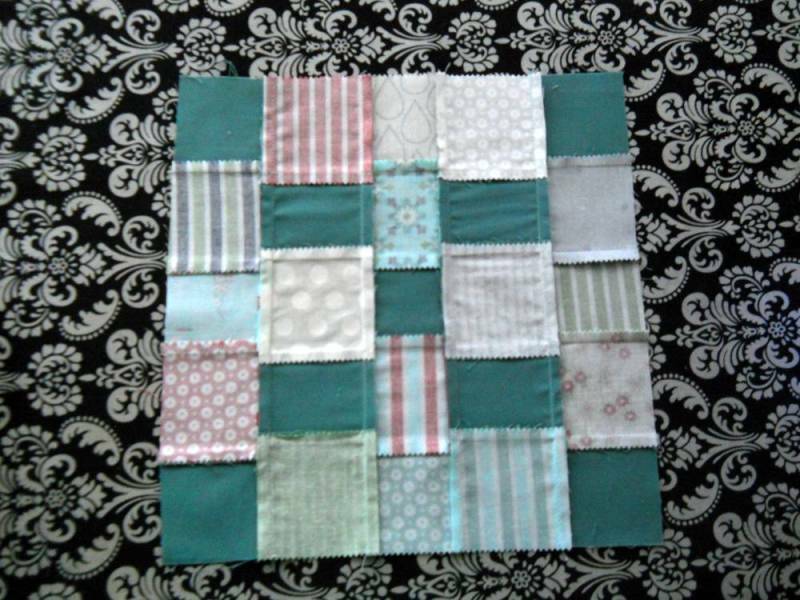 I would love to make it in a smaller size – maybe use your instructions and make two smaller quilts out of it. Oh I can see it now in French General shades. Thanks for the great recipe. 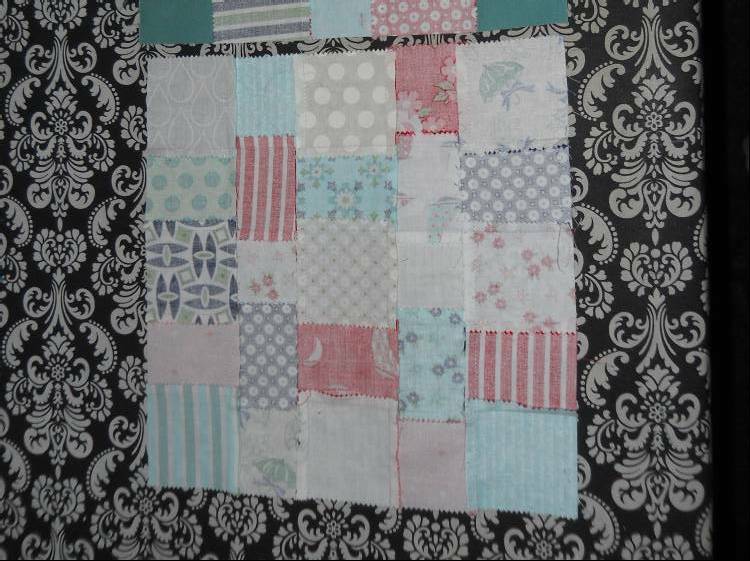 Karin, thank you for this quilt, especially the pressing directions! I can never figure that out ahead of time. I made one like that, too! Instead, I used all sorts of leftover Asian fabric scraps, cutting them into 2 by 2 inches. The “chain” itself is in a cream color, I find it looks very classy. Looking so cool irish and collective one. thanks for this post. I have put this one on “my must” do soon list. Love your pressing instructions also. I just wanted to take a moment to thank you and the other gals here at Moda Bake Shop for the amazing projects and clear tutorials you provide. I really appreciate the time and talent you guys so willingly share. 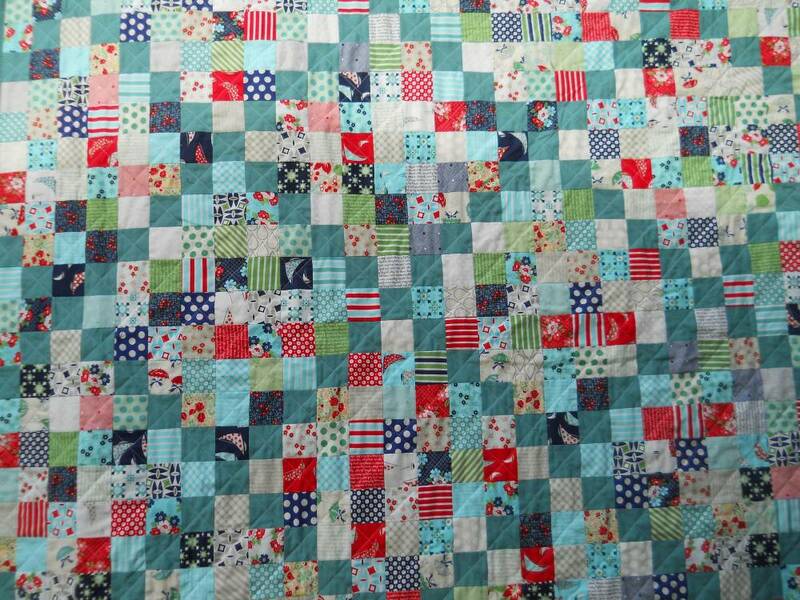 You have made quilting doable and FUN for me as I start this dance with quilting. Thank you! 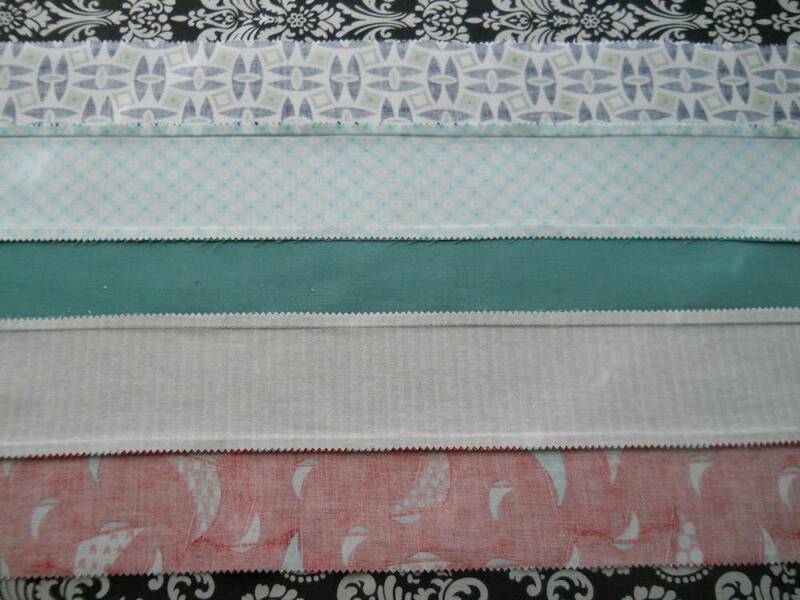 Great project – this would be a great way to use up scraps! 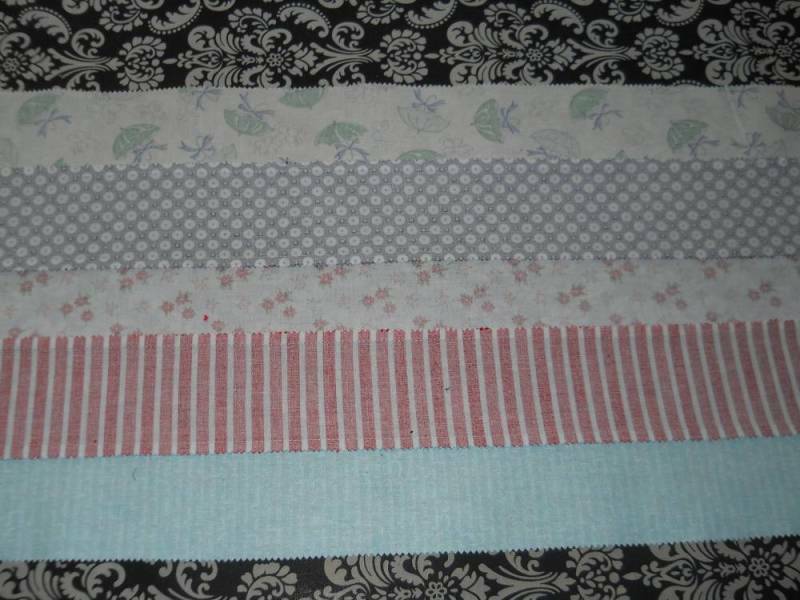 Someday I’m going to make a queen-size quilt — when I finally get myself a mid-arm machine on which to quilt it! 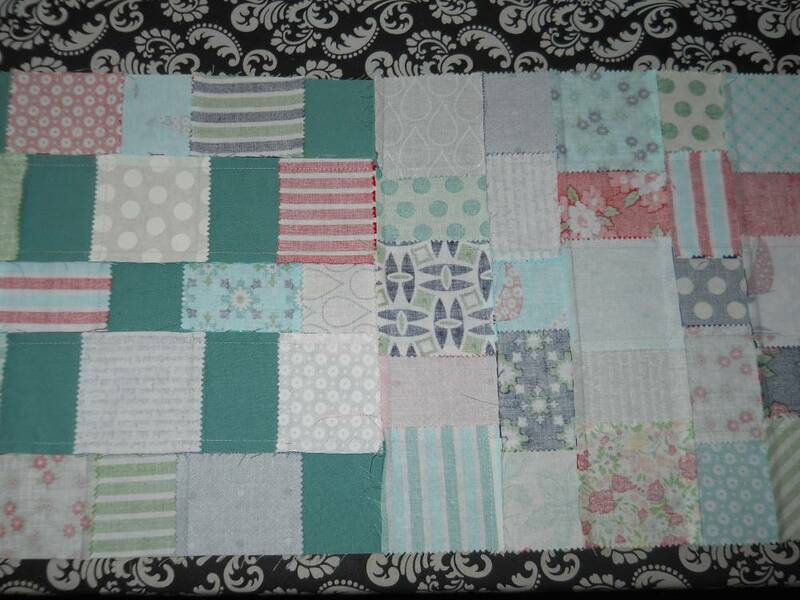 I love how this quilt looks super challenging, but is not really all that complicated. It’s lovely! 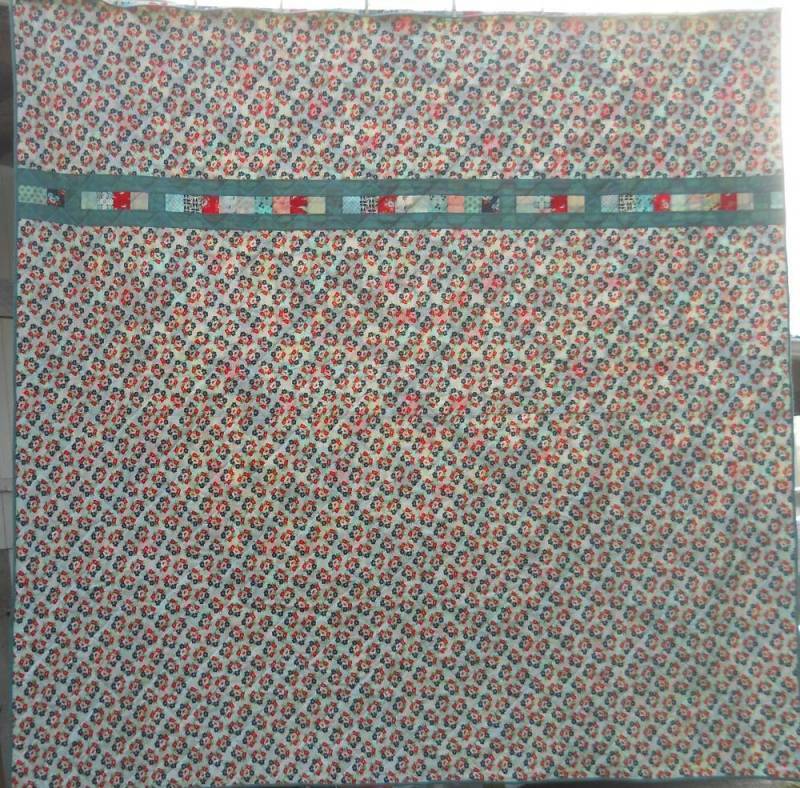 Rachel, you don’t need a quilting machine to quilt a queen size quilt… I did this with no problems on my domestic sewing machine. I have a Pfaff and it does not have a large throat at all. 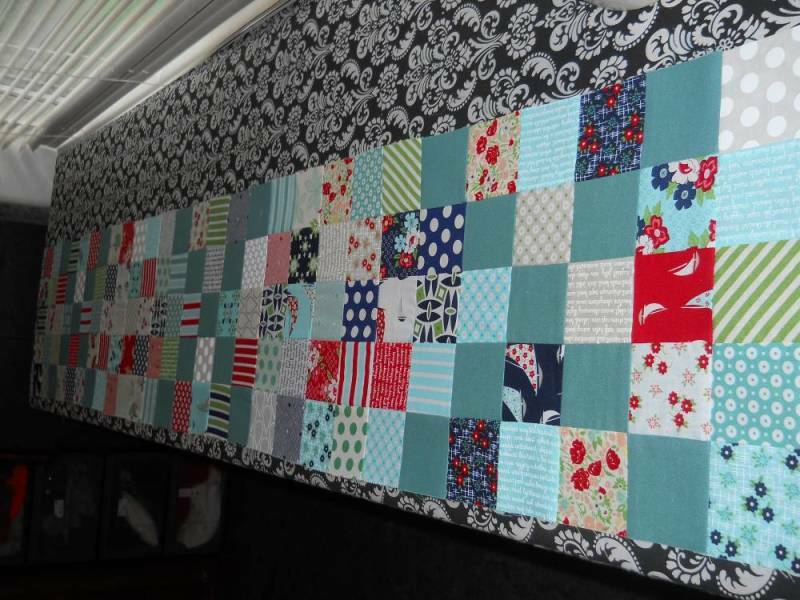 I have done dozens of quilts completely from piecing to quilting on it, most of them 80×80 or bigger. I did one about 30 years ago, but we called it “many trips around the world.